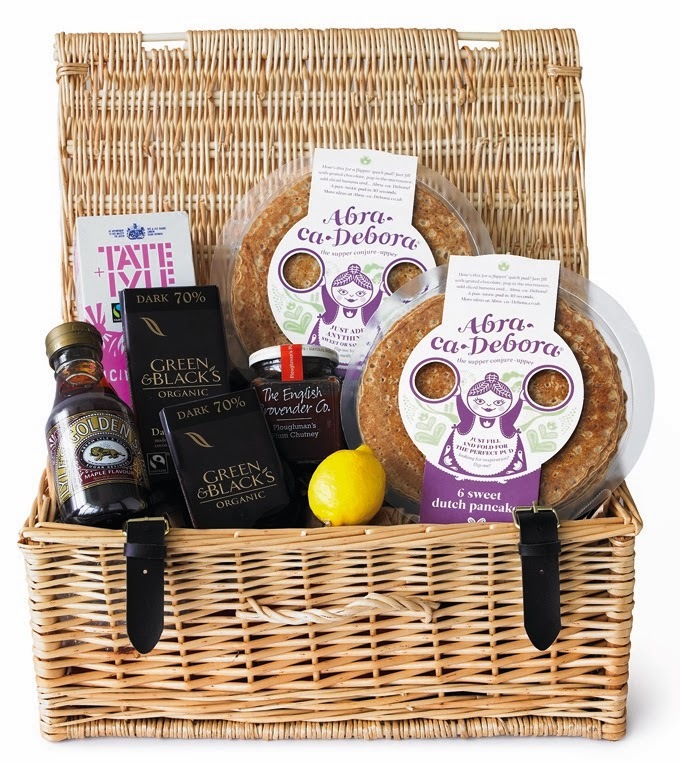 Shrove Tuesday or as it is more often called Pancake Day is coming soon and to celebrate it I have this rather fabulous hamper from Abra-ca-Debora to giveaway. It's filled with full size and mini pancakes and some rather scrummy toppings. What more do you need to celebrate pancake day? Abra ca Debora sell ready to serve Dutch pancakes. They’re rather like the pancakes that British families eat on Pancake Day. Abra ca Debora make them from flour, fresh milk, eggs and vegetable oil. Dutch pancakes are usually the size of a dinner plate, thicker than a crêpe and thinner than an American pancake. They’re yummy with sweet and savoury toppings. Check out the Abra ca Debora website for some great topping ideas. If you would like to enter just leave a comment telling me what your favourite pancake topping is and then enter using the rafflecopter box below. This giveaway will run until 4 March 2014 (Pancake Day) and is open to residents of the UK. There's still time to enter my Triple Cookbook Giveaway and remember to check The Food Blog Diary regularly for all the latest foodie giveaways. Disclosure: Abra ca Debora kindly sent me a hamper out to try. I was not expected to write any positive reviews and any opinions expressed are my own. I love lemon juice and sugar! I love simple lemon and sugar. Lemon and sugar is my favourite topping. I like golden syrup inside, roll the pancake up and squeeze lemon juice on top - yum! Lemon and sugar - so good! I'm so traditional (or boring maybe) my favourite is simply lemon juice and sugar, in fact thinking about it it's the only thing I sprinkle sugar on these days. The traditional lemon juice and sugar. Traditional lemon and sugar for me. after last night's tea - melted nutella! Golden syrup is my favourite! It used to be golden syrup... now I mix peanut butter and maple syrup and drizzle it over the top... YUM! Good old lemon and sugar! My favorite pancake topping is blueberries and whipped cream. I've been being way indulgent lately and doing sorghum and butter. Yummy! At the moment I'm craving lots of caramel sauce! Fresh strawberries on a stack of pancakes. Nothing better. I love savoury toppings - things like cheese and mushrooms. banana, maple syrup and ice cream! Banana, cream and 85% dark chocolate. Lemon and sugar all the way! Leave a comment telling me what your favourite pancake topping it. Rum and raisin ice cream. Freshly squeezed orange and a bit of sugar mmmmmmm!